Web. On January 13-15th, 2011. I delayed to blog about it, because I'm struggling lost circulation at depth 437m in limestone i fixed it previously but it revenge from us, we are now at 891m depth. It but me in bad mood to blog about what I'm thinking to improve my blog. During the online streaming of this session a pulse in my mind push me to ask; What is the best blogging service for scientist Blogger, Wordpress, etc.? you will see my question and the answer at time 48:12 Sorry geeks, it was confusing to me. Thank you for your answers. This video does not exist. I found the best discussions for my question here on Discussing WordPress for Scientists. Also here is my Q? on LinkedIn Answers http://linkd.in/gN3yPS. In an aquifer with a water table (unconfined aquifer), the volume of water released from groundwater storage per unit surface area of aquifer per unit decline in the water table is known as the specific yield, Sy. also known as the drainable porosity. 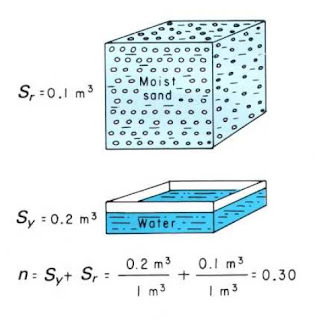 Hydrologists divide water in storage in the ground into the part that will drain under the influence of gravity (called specific yield) and the part that is retained as a film on rock surfaces and in very small openings (called specific retention). The physical forces that control specific retention are the same forces involved in the thickness and moisture content of the capillary, fringe. The porosity of a soil or rock is that fraction of a given volume of material that is occupied by void space, or interstices. 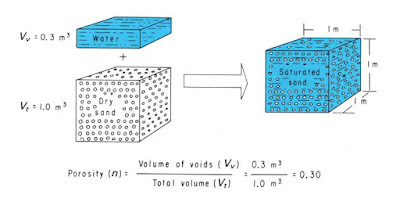 Porosity, indicated by the symbol (n), is usually expressed as the ratio of the volume of voids. Most rocks naturally contain a certain percentage of voids that can be occupied by water.